So Grumpy Cat got more rock-star cheers from the BookCon crowd at BEA than John Green did. 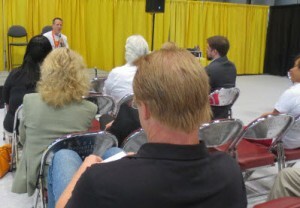 Nevertheless, the trade show’s first-ever Author Hub for entrepreneurial authors held its own. And one author managed to sign and give away 500 copies of her book on Saturday. Publishing Perspectives Editor in Chief Edward Nawotka and I will host a live Twitter chat at 11 a.m. ET / 8 a.m. PT—and that’s 4 p.m. BST in London. Who was I worried about? Bob Mayer. If you had asked me before BookExpo America’s (BEA) all-new uPublishU Author Hub opened, I’d have explained that Mayer, a prolific author (and publisher of other authors at Cool Gus) is demanding, opinionated, and devoted to the self-publishing ethos. He’s also a former Green Beret who could chase me from the Downtown Stage to Bowker’s booth and back if he wasn’t happy with how things shaped up in the Hub. 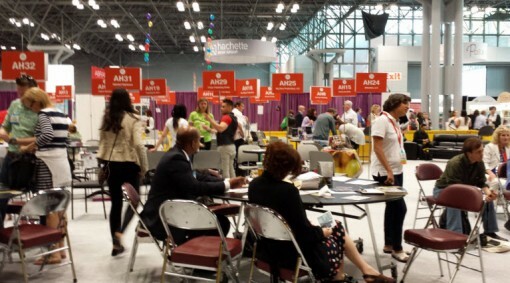 So I’m glad to see from him and from his associate Jen Talty this perceptive set of 10 Observations on BookExpo America from the Author Hub. We felt the Author’s Hub was a great idea. It gave us a place to have meetings with companies like Bookbub, Library Thing and other platforms that help us reach our readers…We’ll be back next year for it because…We left BEA feeling very upbeat and positive about the direction of Cool Gus and publishing. While those of us working on the Hub saw many things we want to refine and re-evaluate, of course, the concept itself was a leap of faith for BEA and for each of the authors who took a chance on buying a membership and for the many smart speakers and industry leaders who agreed to contribute to our programming, which was my area of responsibility along with overseeing things once we’d opened. 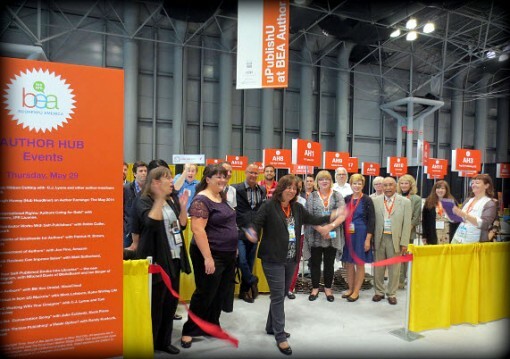 Special credit goes to Steven Rosato, the Reed Exhibitions events director who established the concept of a working center for entrepreneurial authors on the trade-show floor and shepherded the idea into reality. 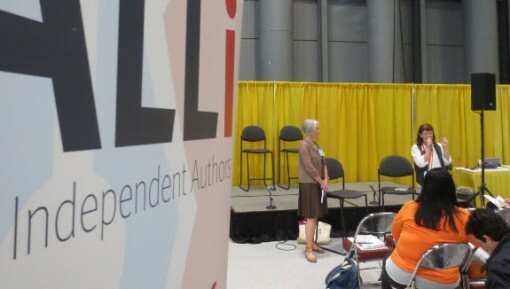 Last year, London had staged an Author Lounge (this year Author HQ), originally with Authoright’s programming for entrepreneurial writers, and BEA had offered no such center of activity for them in 2013. This year, Rosato changed that. And he deserves thanks and praise. The nice thing is that I can finally show you something of how the Hub looked and give you a sense for what was going on there. I called it my “sunflower pasture with furniture” because thanks to Sally Dedecker and Reed’s Nancy Hughes, we were surrounded by bright, yellow drapery, not the gray or black stuff you see in so may trade-show settings. While we didn’t have an archway at the entrance, as the London Book Fair has for its Author HQ, we had lots of good seating (everybody at BEA wants to sit down), a small sea of Premium members’ tables and chairs, networking tables, and a charging station, as well as a small stage and mics. We had a full two days of programming, open to everyone who wanted to join us — sometimes, yes, in competition with the big Downtown Stage beside us. For intimacy, if in no other way, we blew the Downtown Stage out of the water. One of my favorite elements of the Hub was the comfortable furniture groupings — sofas, armchairs, coffee tables — that attracted leading lights from Amazon, Kobo, Vook, and other companies. You’d look over and a group of folks would be having a meeting together before heading back out onto the floor. This was great, not least because our author-members got to be around “the companies” and find out they have human faces. Quite quickly after everyone arrived on Thursday, the Hub started taking on that quirky look of a summertime campground. A table card here, a stack of books there, an easel holding a poster, a pile of swag in a tote bag…eventually, each Premium-member author had personalized his or her table, and our Basic members settled in at our large round networking tables. With Victoria Noe’s help (as one of our Hub authors), I managed to have enough coffee to keep going. And, ironically one of the ways we could tell things were going well was the ebb and flow of the headcount. Our “Don’t Sit Down!” programming concept meant that at times we had a nice crowd of folks for a presentation and, at other times, almost everyone was out on the BEA floor in meetings and seeing other events. I found a home I could scurry back to when overwhelmed with the crush of stimulation and information outside our little partitioned spot on the vast floor of the Javits Center. There I could bond and interact with other BEA virgins and self-pubbed heroes. From my table I could meet with select vendors whose services interested me, listen to speakers every half-hour imparting wisdom and insight on every aspect of publishing, or just gulp in a breath and take notes on all I was learning. By the time Nance got to her Author Autographing session (part of the deal in the Premium membership), she found “people were actually lined up” to get a copy of her book. And that was something amplified on Saturday for many of our Hub authors as BookCon came through. 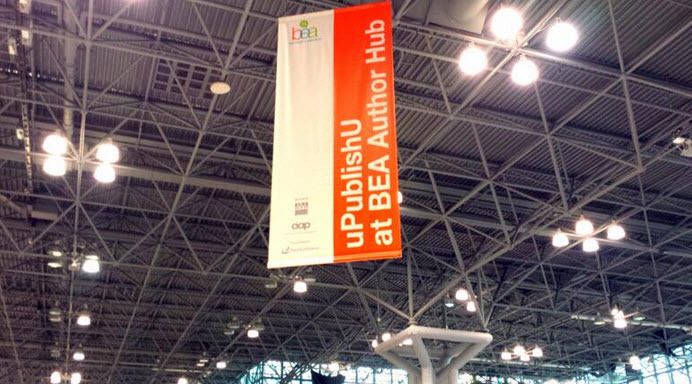 You may already have heard quite a bit about the BookCon element of BEA this year. It was the first time that the ReedPop division has taken over to produce what formerly had been a visit by some “power readers” to the Javits Center. This time, it was arranged as an all-out public day, set in the “consumer wing” of the show, on the southerly end of the Javits. Ten thousand fans of books and the people who write them paid $30 each to be allowed to enter the hall, then roam a small part of the exhibition floor, load up on galleys, book-bags, etc., and attend talks by – and if lucky, get autographed copies from – well-known authors. The enthusiasm was nothing short of “thrilling,” many seasoned, jaded, and (on the last day of fair-going) very exhausted publishers concluded, speaking in almost a state of wonder. It’s quite a sight, close to 10,000 people waiting to enter the venue, and it probably took some fortitude on many of our authors’ parts just to stay put in the Hub as the “swarm” started to bear down on them. But Hub writer Orna Ross – an author of several books, herself, as well as founder of the Alliance of Independent Authors in the UK – tells me that she was able to sign and give away 500 copies of her books, many of which she’d thought she might have to take back with her to London. 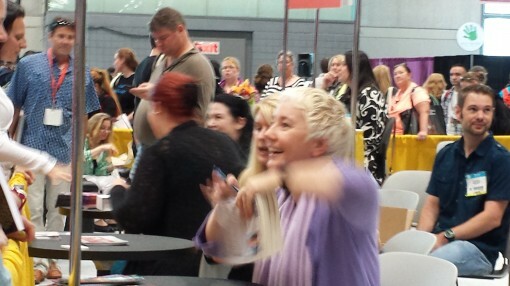 At one point, authors Jasinda Wilder and Jack Wilder, Liliana Hart, and Tina Folsom were doing a brisk business at the Hub’s “headliner row” up front, the crowd moving by, stopping to pick up a signed book and say hello. Special programming next door in the Downtown Stage was so popular that there was no hope of doing much programming in the Hub. But we’d foreseen that and, of course, the uPublishU conference was going forward on three tracks for authors downstairs (included in the Hub membership fee). And as crazy as the BookCon atmosphere felt compared to the busy but orderly operation of the trade show itself on the previous two days, Saturday’s energy was contagious and had that knockabout, floor-sitting, Dr.-Who-Fest “con” air of camaraderie, everyone churning through the hall in a common search for big names and surprise finds. Lara Nance writes that she found the info in her BEA listing about her book was strong enough to attract reader interest. 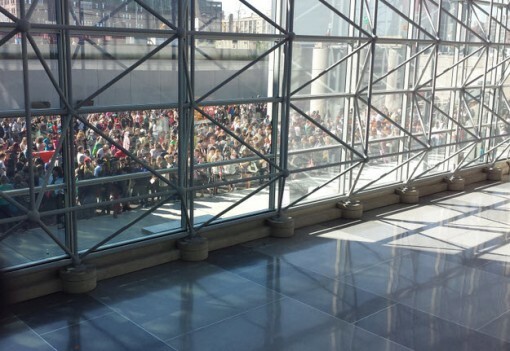 It’s an interesting phenomenon, the introduction of the BookCon mosh-pit fervor. Quiet panel discussions at the uPublishU Conference were punctuated by loud, long roars and screams of delight, a lot of them from Grumpy Cat ‘s nearby appearance. When not trying to move though the crowds, it was refreshing to see many thousands of book buyers under one large roof – the lifeblood for all sectors of the book industry. And even with the chance-to-see-a-celebrity angle, it was fantastic and reaffirming to see vast queues leading up to book purchases. That can only be a good thing…While the book fairs are now accepting that they should include authors, where to include them hasn’t yet been fully cracked. The Author Hub was next to the large and often loud Downtime Stage and uPublishU took place next to BookCon (the licensing panel I was on took place at the same time as a John Green signing next door; he just won on the head count). But it’s a good start and all the key book fairs will get there. All in all, the Hub experiment showed us many points to reconsider and refine but it was peopled by game, friendly, cooperative and collaborative authors who enjoyed each other’s company and the chance to participate in this trade show’s first welcome to entrepreneurial authors. With the launch of the Author Hub, for the first time we actually had a footprint on the convention floor. That’s a step and a good one, thanks to Mayer’s and his author-colleagues’ support in making it a reality and giving it a chance to work. 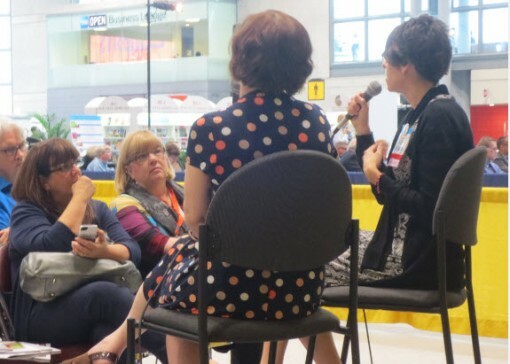 How important do you think it is for entrepreneurial authors to find a place for themselves in the relatively traditional setting of these major trade shows like BEA? If you didn’t participate this year in BEA’s Author Hub, would you be interested in doing it in another year? If you were with us in the Hub this year, what do you think were the best elements? And what needs the most work?